You guys this recipe was originally published on February 26, 2016. Whaaaat?! I can’t believe it was that long ago! But since then it has really become a staple on the blog; routinely in my top 5 visited recipes month after month. And it has a special place in my heart – it is honestly one of my favorite recipes. As you guys are well aware of now, I am allergic to dairy. Well, whenever I go to an Italian restaurant this is the recipe I want to order. 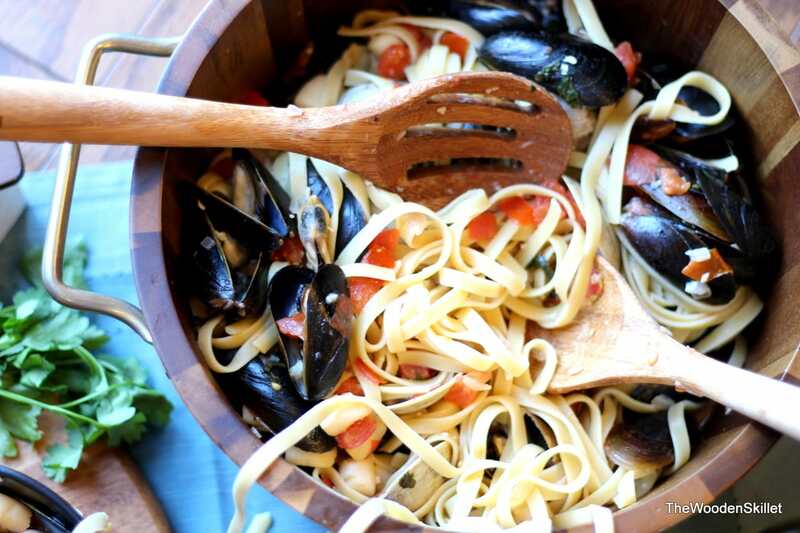 I want a delicious bowl of perfectly cooked pasta, dripping in a dairy-free white wine sauce and covered in mussels, clams and scallops (you could throw in some shrimp and I wouldn’t be mad either). But no matter what restaurant I go to, there is cream involved in their version of this recipe so I can never order it! This is my perfect bowl of pasta (and I don’t eat pasta that often, but when I do, it looks like this). I thought now would be the perfect time to update it because this is the perfect Valentine’s Day recipe!! It is actually incredibly easy to make and is ALWAYS a hit. Feel free to use gluten-free pasta as well!! Quick tip – read my tutorial on how to prepare and debeard mussels quick so you can be a pro! I updated the recipe a bit and updated the photos, but just for fun a kept two of the originals down below …. for sentimental purposes. You guys I had no idea what I was doing: I didn’t even know what a photography board was, I didn’t understand light, I am sure I was using an automatic mode on my camera… man I have come a long way. And it is kind of fun to see the comparison. Let me know what you guys think! …. and the older versions…. Prepare, clean and soak mussels and clams. In large pot, boil water and begin cooking pasta – set timer to ensure you are notified when it is cooked al dente. In separate, deep saute pan, melt ghee on medium heat. Add 1 Tablespoon olive oil, shallots and garlic. Let the shallots and garlic cook about 2 minutes on high while stirring constantly. Add white wine, lemon juice and parsley; stir. Add clams and cover while mixture simmers, for 3 minutes. Remove cover quickly and add mussels, bay scallops and tomato. Cover again for an additional 2 minutes. Remove cover, stir and add a dash of kosher salt, to taste. Let simmer, stirring occasionally for 3-5 minutes to ensure scallops are fully cooked. If you haven’t already, strain pasta when cooked al dente and return to same pot and immediately add 1 Tablespoon ghee and 1 Tablespoon of olive oil; toss to coat. Add seafood mixture with all broth to pot of pasta and toss well. Serve immediately with warm French bread, if desired. this looks SO good! I love the simplicity of your photos too, they are so beautiful! and you know what, your older photos aren’t even that bad! mine were shocking ha ha it’s great to see how far you’ve come! loving your work! 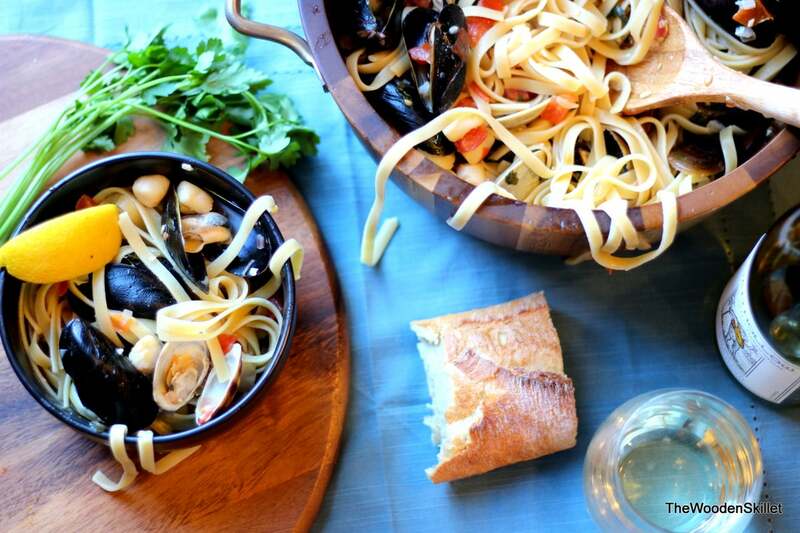 We love mussels but I’m terrified to make them at home. After reading through your recipe, I think I might just have the courage to give this a try. Sounds DELISH!! That makes me so happy to hear, Christina!!! Yay! It really is one of my favorite recipes (my husband’s too). Hope you guys enjoy it! I know you can do it! Erin, your photography sells the recipe by itself! I haven’t tried it yet but will. Thank you!!! It is one of my favorite recipes!!! Can’t recommend it enough ? Well, it calls for one box of fettuccine, so I generally serve it has two really big bowls of pasta or about four smaller bowls – hope that helps! !